Corporal Anthony Casamento (16 November 1920 - 18 July 1987) was a U.S. Marine during World War II. On 12 September 1980, President Jimmy Carter presented him with the Medal of Honor 38 years after Corporal Casamento's acts of heroism on Guadalcanal in 1942. Anthony Casamento was born on 16 November 1920 in Brooklyn, NY. He enlisted in the Marine Corps on 19 August 1940 in New York City. After completing recruit training at the Marine Corps Recruit Depot Parris Island, SC, he was assigned to the 5th Marines, 1st Marine Division. Six months after the Japanese attack on Pearl Harbor, 5th Marines was on its way to the southwest Pacific to take part in the initial invasion of Japanese-held territory as part of the 1st Marine Division. The Marine landing on Guadalcanal began in August 1942 and Cpl Casamento made the assault with Company D, 1st Battalion, 5th Marines. On 1 November 1942, while serving as a leader of a machine gun squad in an attack on Japanese positions, Cpl Casamento's Marines came under heavy enemy fire near the Matanikau River. During the ensuing battle, all members of the unit were either killed or severely wounded. Despite his own multiple wounds, Cpl Casamento continued to provide supporting fire and heroically held the enemy at bay, thereby protecting the flanks of adjoining companies until he was physically unable to continue. Corporal Casamento was treated at a medical aid station, then shipped back to the U.S. and admitted to the naval hospital in Oakland, CA. In 1964, it was learned that two eyewitnesses to Cpl Casamento's heroism were still alive. That set in motion a chain of events that would ultimately result in his finally receiving the Medal of Honor in 1980. 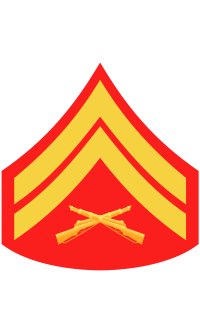 Rank and organization: Corporal, Company D, First Battalion, Fifth Marines, First Marine Division. Place and date: Guadalcanal, Solomon Islands, 1 November 1942. Citation: For conspicuous gallantry and intrepidity at the risk of his life above and beyond the call of duty while serving with Company "D", First Battalion, Fifth Marines, First Marine Division on Guadalcanal, British Solomon Islands, in action against the enemy Japanese forces on 1 November 1942. Serving as a leader of a machine gun section, Corporal Casamento directed his unit to advance along a ridge near the Matanikau River where they engaged the enemy. He positioned his section to provide covering fire for two flanking units and to provide direct support for the main force of his company which was behind him. During the course of this engagement, all members of his section were either killed or severely wounded and he himself suffered multiple, grievous wounds. Nonetheless, Corporal Casamento continued to provide critical supporting fire for the attack and in defense of his position. Following the loss of all effective personnel, he set up, loaded, and manned his unit's machine gun, tenaciously holding the enemy forces at bay. Corporal Casamento single-handedly engaged and destroyed one machine gun emplacement to his front and took under fire the other emplacement on the flank. Despite the heat and ferocity of the engagement, he continued to man his own weapon and repeatedly repulsed multiple assaults by the enemy forces, thereby protecting the flanks of the adjoining companies and holding his position until the arrival of his main attacking force. Corporal Casamento's courageous fighting spirit, heroic conduct, and unwavering dedication to duty reflected great credit upon himself and were in keeping with the highest traditions of the Marine Corps and the United States Naval Service. 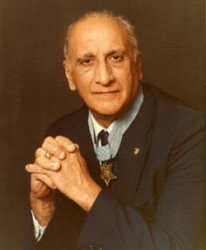 In a White House ceremony, former Corporal Anthony Casamento was presented with his Medal of Honor by President Jimmy Carter on 22 August 1980, 38 years after his heroic actions took place. Attending were Casamento's wife and daughters and Gen Robert H. Barrow, Marine Commandant. A park in West Islip, NY (his post-war residence) is named after him as is a stretch of highway in Farmingdale, NY. Corporal Anthony Casamento died on 18 July 1987 in the VA hospital in Northport, NY, after a long illness. He is buried at Long Island National Cemetery in Farmingdale, NY, in the Distinguished Service Section, Grave 79A. Casamento is presented the Medal of Honor by President Jimmy Carter at the White House.